IDESA Certificate awarded to Ken Konschel in recognition of their innovative work with Aquaponics and Hydroponics in East and Southern Africa. 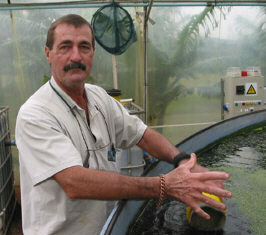 Ken Konschel has for the past 20 years been active in the Aquaponics industry. He has traveled extensively in the USA visiting aquaponics and aquaculture projects, universities and hydroponic farms gathering new information and the latest techniques. In 2003 he won a gold medal from the Institute of Inventors for his efforts in designing an Aquaponics system. As Managing Director of Aquaponics Africa he has set up pilot schemes in Zimbabwe, Empangeni South Africa and presently the United Kingdom. These have been a remarkable success and the system is constantly being fine tuned for greater efficiency. Aquaponics Africa operates from a 25 hectare farm site in Northern Natal where all aspects of the system are tested.The unit that is in operation there also serves as a demonstration model and a training site. The concept which has been successful in the United States of America and Asia is well suited to the African environment. The warm weather reduces heating costs (solar energy can also be used) and there is a significant water saving as it has a recirculating system and only requires topping up from time to time. Fresh vegetables and protein in the form of fish are easily produced on a regular basis.